I learned to snowshoe on a golf course while attending Michigan State University. I learned right away that I was way overdressed and that it was important to spread your feet a bit to avoid tripping over the tails of the snowshoes. The beauty of snowshoeing is the simplicity of it. Most people pick up the activity in an hour or less after stepping into a pair of rug beaters for the first time. Those who fear the slip-sliding world of skiing quickly discover that’s not part of snowshoeing. But the real lesson I learned that afternoon on the Forest Akers Golf Course – besides to stay off the greens – was that the most important thing in snowshoeing is snow. We had an inch, if that, and I quickly realized how absurd it was to be high stepping it down a fairway with snowshoes strapped to my boots. There was no reason to use them. 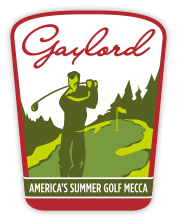 That’s why Gaylord is the snowshoe capital of the Lower Peninsula. 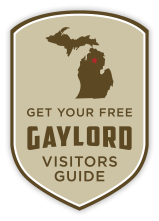 Few cities in Michigan can match Gaylord’s combination of numerous trails, interesting terrain and places to rent snowshoes. But most of all Gaylord has snow. Lots of it. The reason for Gaylord’s snowy winters is not that Alpine village theme on main street. It’s location. Perched on top of the central plateau that extends from Grayling to Indian River, Gaylord boasts the highest elevation of any city in the Lower Peninsula at almost 1,400 feet. That translates into colder temperatures, including Michigan’s record low, a minus 51 degrees in 1934 in the Pigeon River Country State Forest. And more cold means more snow. Gaylord averages almost 160 inches a winter and the higher elevation means the surrounding area not only gets more snow but holds onto it longer. Lucky us. We can visit Gaylord in April and still have a reason to pack our snowshoes. Louis M. Groen Nature Preserve: Otsego County’s newest park is this 789-acre tract on the edge of Johannesburg that opened in 2012. The preserve features two lakes, 20 miles of trails, some rugged terrain, especially around Johannesburg Lake. And always a lot of snow as its highest point is 1,370 feet. The preserve is crisscrossed with trails, many of them old two-tracks that are marked with 86 numbered junctions. A map in this park is a necessity. In the winter, the preserve is a popular destination for snowshoers and cross country skiers. The park staff grooms a pair of 3-mile loops, one for classic skiers, the other for skate skiers. Snowshoers have the rest of the trails to explore and rentals are available. For more information on location and hours the preserve is open Click Here. Sturgeon River Preserve: Located just south of Vanderbilt this 40-acre preserve was donated to the HeadWaters Land Conservancy in 2011. The heart of the preserve is its 2,100 feet of frontage of the Sturgeon River, a Blue Ribbon trout stream that flows through the northern half of the property. Beyond the river, the terrain varies from cedar swamps and clearings of towering bracken ferns to ridges and hills forested in birch, hardwoods and some impressive pines. The limited acreage makes this tract more of a pocket wilderness that’s easy to miss along Whitmarsh Road in Ostego County. But you shouldn’t. 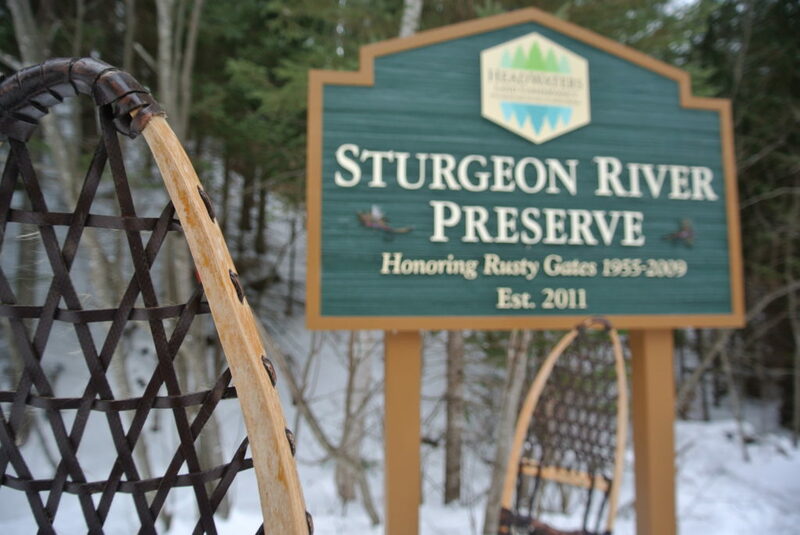 Sturgeon River Preserve is gem and its mile of trails and boardwalks are ideal for families looking to introduce children to snowshoeing. Click Here for a map or description of the trail or the HeadWaters Land Conservancy for snowshoeing events in the preserve. 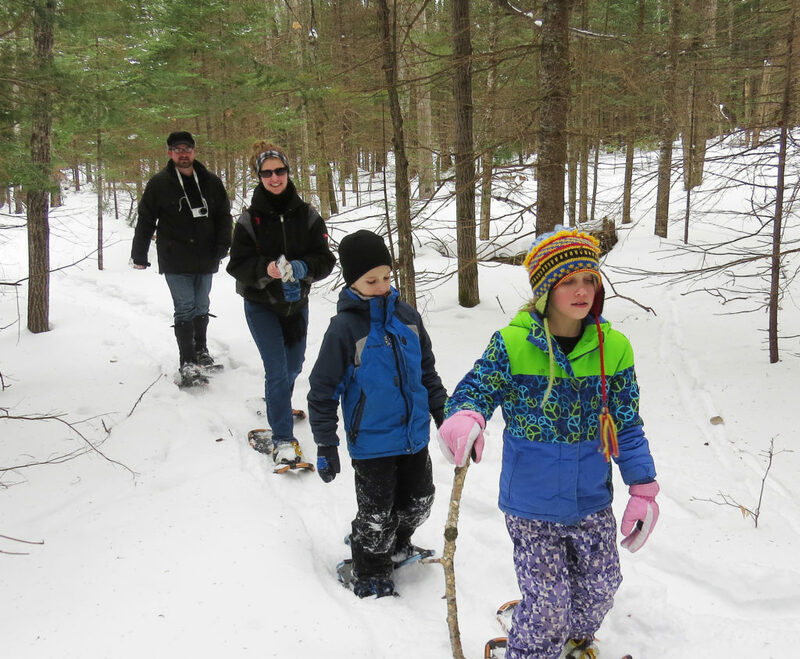 Green Timbers: In the Pigeon River Country State Forest backcountry skiers head to the Shingle Mill Pathway but for snowshoeing I always preferred this 6,388-acre tract. Green Timbers not only has scenic vistas but also offers the opportunity to possibly see elk. The 1918 successful reintroduction of elk to Michigan took place just 1.5 miles to the north and Green Timbers has remained an important area for the species. A great afternoon outing is to begin from the Sturgeon River Road trailhead and trek 3.8 miles to where Honeymoon Cabin once stood. The free-use shelter is now gone but the sweeping view of the Sturgeon River Valley is still there and best enjoyed in the winter. For a map or a trail description Click Here. Forbush Corner: Located at the Frederic exit of I-75, this small but unique ski center is a haven for Nordic racers who gladly skip the glitz at night of the large ski resorts for the best groomed tracks during the day. Not a skier? In the middle of the system of ski trails are 9 kilometers of marked snowshoe trails that traverse a rolling terrain and begin and more importantly end at the center’s cozy warming center. Forbush Corner is a great destination when some in your party want to ski and others want to snowshoe. Rentals are available and are only $25 per day for the entire family and that includes trail passes. Treetops Resort: Snowshoeing is a mainstay at downhill resorts now including this one located 4 miles east of Gaylord. Treetops has 7 kilometers of woodland trails for snowshoers plus rentals and all the amenities you’d except for a major resort. The trail system is open Friday through Sunday plus additional days during the holidays and begins at the Jones Activity Center where rentals and trail passes are available. For more information, contact Treetops at 866-348-5249. Warner Creek Pathway: Located 15 miles west of Gaylord, Warner Creek is a lightly used trail in the winter that offers scenery and solitude. It winds through Hardwood Hills, a rugged slice of the Mackinaw State Forest. But most of the 3.8-mile pathway is a surprisingly level and easy trek on snowshoes, as if whoever laid it out knew you just wanted to shuffle along and enjoy the snowy woods. O’Briens Pond, reached within a mile from the trailhead on M-32, can be an exceptionally beautiful spot in the winter. Click Here for a map or trail description. Boyne Mountain: Among snowshoers this downhill resort is best known for its Summit-to-Stein’s Snowshoe Supper every Friday and Saturday evening that begins with a lift ride to the top, a bonfire halfway down the mountain and a fondue-style dinner when you finally kick off the rug beaters for good. But Boyne Mountain also has a dedicated trail system of 3.5 kilometers for snowshoers along with rentals. For more information, contact Boyne Mountain at 855-688-7024. Jim DuFresne is the main contributor to MichiganTrailMaps.com and author of more than a dozen guidebooks to outdoor recreation in Michigan.